Prototype: Low side car, boxcar, and dump car painted and lettered for a construction train. Modern design construction vehicle. Model: All of the cars have Relex couplers. Length of the freight car set 34.5 cm / 13-9/16". Contents: 5 no. 24188 straight track, 4 no. 24172 straight track, 1 no. 24224 curved track, 1 no. 24612 right turnout, and 1 no. 24977 track bumper. The construction vehicle is made of metal. "Gravel" freight load included. Track for expanding a C Track layout. A variety of ways to play with the inclusion of the construction vehicle and load. 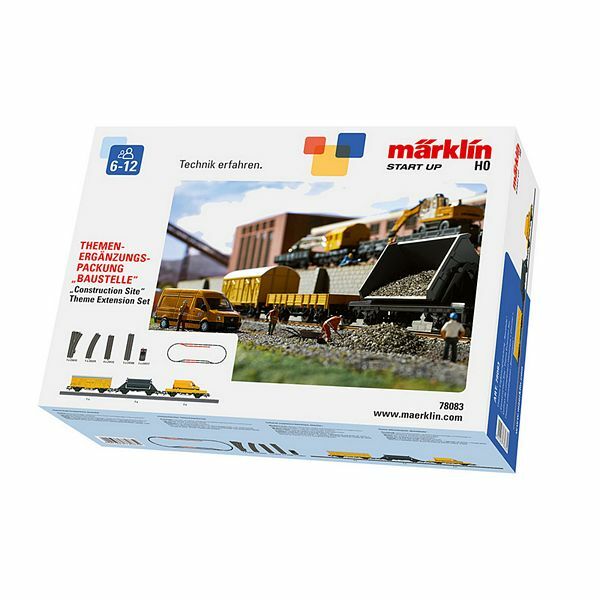 An extension set that goes well with the 29183 "Construction Site" starter set.